Bidsonline develops a range of hand-held computer programs to manage your auction more efficiently. The programs run on Microsoft’s windows mobile operating system. Booking in vehicles. 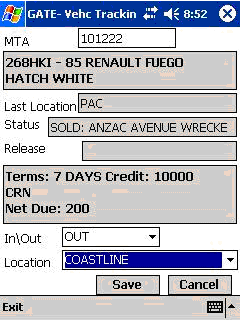 On arrival vehicles are identified using a series of drop down boxes of make, model etc or using the VIN lookup program. Any problems noted on the staff automatically create an inspection task in the workshop module of our auction software. Inspections. Detailed inspections and quotations can be made using a hand-held. The program steps the inspector through the area, problem and resolution, this creates a code which in turn retrieves a price for the work. The rectification quotation is then automatically loaded on to our vendor online reporting system for approval. Stock-take. 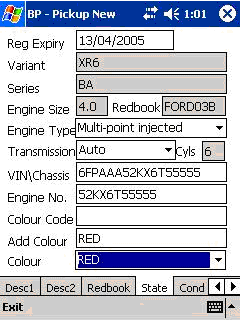 Using the built in scanner bar codes on vehicles and equipment are quickly scanned to produce a stock take. Gate tracking. You can use the hand-held at your gate to check vehicles or plant leaving your auction. Cataloguing. The catalogue program lets you build up a catalogue by scanning vehicles or plant on the auction floor. Significantly improving the time to catalogue for an auction.